Brookhaven Cabinet Reviews - American Made Semi-Custom Cabinets! Last Updated March 24th 2019: Brookhaven have been producing cabinets for over 50 years, and in that time they’ve developed a keen understanding of the skills required to produce well made furniture. Brookhaven is owned by Wood-Mode and operates as a semi custom cabinet producer for the brand. 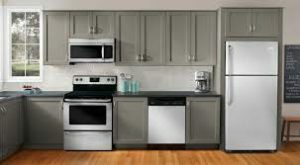 In this Brookhaven Cabinet Reviews guide we will spend some time talking about Brookhaven's history, the types of cabinets they offer, specifications of their cabinets, and their warranty policy. Wood-Mode themselves have been operating since the 1940s and are now a well known name in the industry. Producing a wide range of home furniture they always strive to provide value by keeping prices competitive and quality high. They promote dedication to perfection in their workforce and keep their production within America. 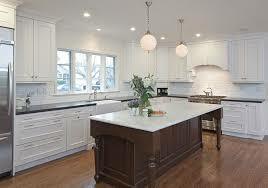 If you are looking for other American made cabinets I suggest Timberlake cabinets and Merillat! The result is skilled, passionate employees who are able to keep an eye over every element of the manufacturing process, keeping the standards very high. Brookhaven are making mid range cabinets to fit with the everyday American’s budget. In the mid price range there is a lot of tough competition but Brookhaven have managed to keep their heads above water and compete by offering good quality in their cabinets. Brookhaven Style I is designed as their budget range. This is for those who still want access to quality, semi custom cabinets but can’t afford the top of the range models. Brookhaven Style II is the premium range. A little more expensive but with even more options this line is more stylish and durable. You’re able to upgrade to furniture grade plywood which allows for more resilience to daily life. ● 11/16" thick particleboard or plywood tops or bottoms, doweled and glued into cabinet sides. ● Toe kick, allowing easier access to the work surface. 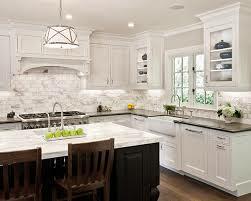 Kitchen cabinetry is Brookhaven’s specialty and what has made them popular with homeowners and tradesmen across the U.S.A.
● Brookhaven I: Frameless design available in over 20 door styles in furniture grade plywood, high-density furniture board and natural woods. ● Brookhaven II: traditional framed construction cabinetry available in nearly 30 door styles in furniture grade plywood, High-density furniture board and natural woods. There’s a lot of options available so let’s see the main choices you’ll face when purchasing a Brookhaven Cabinet. Brookhaven cabinets come with lots of different options to personalise them to your home. Firstly you can select to keep the furniture board or upgrade to plywood. 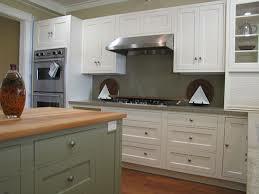 Plywood offers more durability and will make your cabinet longer lasting, It may be worth paying a little extra for it. There are a number of veneer and laminate options so it depends on your budget. The doors are available with Inset or overlayed doors depending on the look you’re going for. There are over 200 different door styles to choose from, ranging from traditional to modern. This let’s you customise your cabinet to fit your home’s existing feel and decoration, matching your kitchen. The one you’ll choose will depend on your design choice and personal preference, but some of these are perfect to give your furniture an aged look. You can choose the colouring of your finish from the large range that Brookhaven offer. Choose from light, medium or dark finishes which are all designed to bring out the natural colour of the wood. After finish the wood is sealed to protect the surface from wear and tear. Brookhaven offer a range of extras and specialist options for the less mainstream kitchen owner. You can select glass doors, metal frames and some unique handles that complete the specific look of your cabinet. If you have something in mind they should be able to make it a reality. Both of Brookhaven’s lines have a lot of options for you to consider. You’re always best off going down to your local dealership to see what they have available, this way you can see and touch the materials and really get to grips with them. Brookhaven understand the customer’s needs and strive to give the choice to make your semi custom cabinet feel custom. Brookhaven cabinets are quite good! They are practically identical to the genuine cherry cabinets that I had previously owned, and do a far better job resisting scratches and dents than the ones made of real wood did. “The finish comes off or has spots all over them. Even used what was suggested in the manual that came with them.” - Peter P.
It’s very frustrating when a cabinet doesn’t last as long as possible, but with all mid range cabinetry you need to be realistic with your expectations. Brookhaven products are generally made well, but for the best possible results you should look to upgrade to the plywood option. This gives a better look and feel and should add some years to your cabinet. That being said you need to be careful with the “more affordable” cabinet makers. You’ll be able to find a bargain, but don’t settle for less. Make sure you take the time to search through the options and double check everything upon delivery if you choose to buy, this way you’ll be able to report a problem early on. Brookhaven protect their products with a limited lifetime warranty. This covers your cabinet for life from all workmanship and material defects which don’t occur through standard wear and tear. Always check with your dealer about your specific product so you know where you stand if something goes wrong. Brookhaven are a mid range provider than is going above what would be expected, in terms of quality, for the price. They’ve shown they know their way around construction and have built on their successful history to keep moving forward. Brookhaven are cheaper than some alternative brands and have an impressive choice. 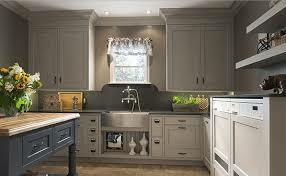 It’s unlikely they’re going to blow you away with any of the options but for good solid cabinetry they’re doing well. Upgrade what you can for a longer lifespan and take advantage of the value Brookhaven are providing their customers. 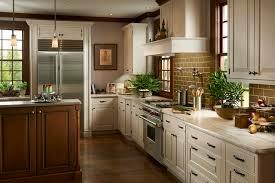 If you are interested in other cabinet reviews, check out our kitchen product reviews page.